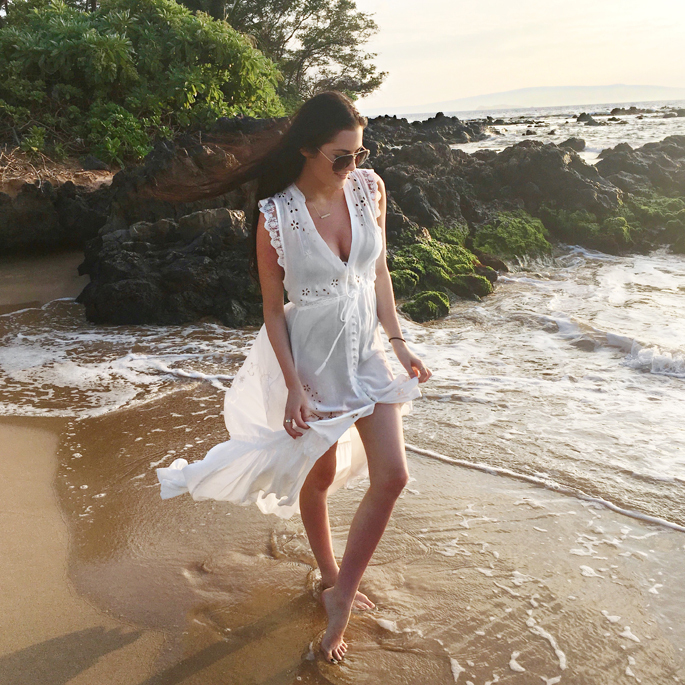 I’ve had lots of questions about my swimsuits and dresses that I’ve been posting on instgram since we got to Hawaii so here’s a roundup of everything I’ve worn and where you can find them! If you have any good restaurant recs in Maui let us know! We have our favorites we always go to (Duke’s, Kimo’s Mama Fish House) but we’re wanting to try something new!! Also- thank you all so much for all the sweet comments you leave on my instagram and blog. I’m so grateful for your continued support, it truly means the world to me. Have a happy Monday!!! Hawaiii looks gorgeous, hope you are having an amazing time! And thanks for linking all your swimwear, I have been on the hunt for a great one piece! I am so jealous of your Hawaiian vacations and your beachwear! So cute! Have you done breakfast at Gazebo? It’s pretty small so your group might have to do takeout! The breakfast fried rice is to die for! 5 Palms is great, I LOVE Cool Kat for a more casual lunch/dinner. Leoda’s is amazing too! 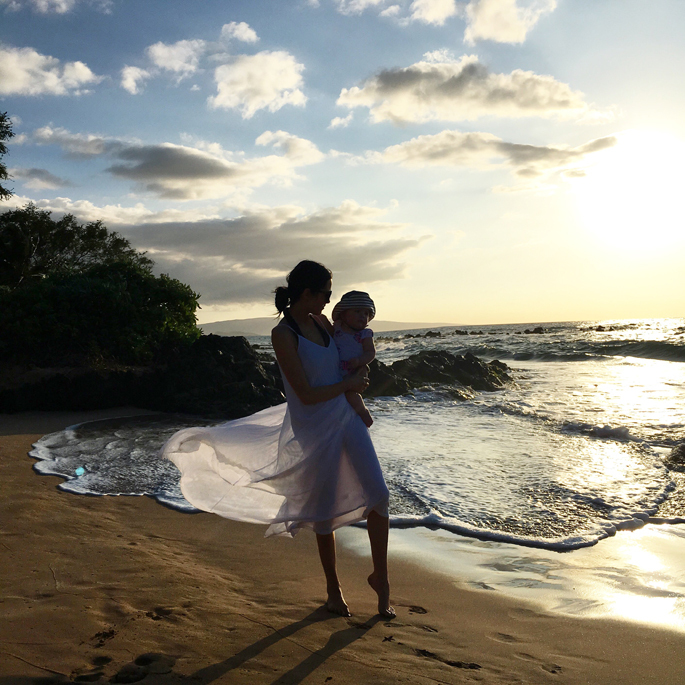 Rach, you have a lot of cute suits, so does little Isla!… It looks like you are having an amazing time in Hawaii! I think it would be awesome if you visited other blogs sometime. Especially those who continuously support you! I have no recommendations for Maui, as I’ve only been to Oahu… but I hope the rest of your trip is a blast! Nicks Fishmarket! Beautiful views and amazing food. Also, the Monkeypod is really great and casual so it’s great for kids! I’ve been following along on Instagram and Snapchat…looks like y’all are having such a wonderful family vacation! What a fun trip. Hawaii is so pretty and I definitely can’t wait for summer! Your vacation looks like so much fun! You and Isla are the cutest beach duo! Hope you are having a wonderful time! Love all your outfit pictures! I love all these looks! I am getting some ideas for our destination wedding next year in Maui. I would recommend Merriman’s in Kapalua, they have a gorgeous sunset cocktail hour and the food is supposed to be great. Your bathings suits are awesome, and you look great, mama! We love Lahaina Grill for a nice dinner out, and Lahaina Pizza Co. has the best pizza and prettiest view. Have a blast! All of these pieces are spectacular. forgot to mention I hope you’re having a great time in Maui with your family- I’m living vicariously through your pics as I await my annual trip to Hawaii. Enjoy! I’m loving all of your suits! That is for sharing the deets. I’m loving all of your suits! Thanks for sharing the deets. Love all your looks. I am shopping now for a trip to Florida, will see what I can snag up! Thanks so much! Leoda’s cafe is AMAZING for lunch and Monkeypod in Wailea is also fantastic!! Hope you have a great time! Super cute love them all! Thanks for sharing babe! Hope you had a wonderful weekend! Sending loves! and Leoda’s are great! Casual atmosphere, great food! I swear, you pick out the best bathing suits!! Thanks for sharing all of them. We have been to all the restaurants you mention, but you must try Merriman’s Kapalua. So, so good – right on the water and amazing view. Reserve for right at sunset…beautiful. This was one of our favorites when we were there for New Years. Another restaurant that we loved, which surprised us, is Star Noodle in Lahaina. We were looking for something more casual, relaxed and less expensive. It was really good and we would definitely go back. It is very busy and a little small so definitely make a reservation. Get the pork buns and then share a bunch of yummy entrees. I love the Maryisa swimsuit! The scallops and cutout make it so unique! Looks like an amazing trip! I’m obsessed with that white dress! You look gorgeous! We went to Fleetwoods when we were there on our Honeymoon and loved it! They also have a rooftop with live music and a more casual dining/drinks setting. But the food in the dining room at Fleetwoods was better than our dinner at Kimos! I also heard Hanu and Mala are good. I love all of your bathing suits! We’re going on a cruise in a few months, and I think I’m going to have to buy a couple of these! Lahaina Grill is a sweet little spot – the design might be a bit better than the food… But the food is still delish! Very romantic and lovely spot close to where you are! I love the last swimsuit. The colour and the cut are perfect! I loooove Hawaii, have you try the Sansei in kapalua, delicious and good ambiance. Love the white dress! So pretty! Absolutely ADORE the black wrap swimsuit! So different and pretty! Girl you are making me want to go back to Hawaii ASAP! And Isla is such a cutie! We LOVE Monkeypod Kitchen! Cool and casual. Everything on the menu is delicious. Star Noodle is small, but the Asian Fusion food is to die for. Try MonkeyPod Kitchen – it’s amazing! Kid friendly, too! If you haven’t tried Paia Fish Market. It’s worth it. Don’t let the looks fool you….very rustic but the fish is SO good. Another must for me is Sansei. If you like sushi, you’ll love it here. Couple more I forgot. Last year we loved Hula Grill. It looks so touristy but the food is great. Seahouse up in Kapalua is a favorite for b’fast or lunch. We love Pineapple Grill up there too and have had wonderful dinners/b’fast. Finally, no visit to Maui is complete for me without dinner at Merriman’s. I suggest you guys try Nobu! I have not been to the one in Maui but I have been to the Malibu location. The food is amazing!! Beautiful photos! Enjoy your holiday, Rachel! Ahh I’m so in love with Hawaii :) You have the best swimsuits, too! Looks like a wonderful family trip and of course you two look amazing! love all of your vacation clothes! especially the dress from revolve! Love all of your swimsuit selections! Black is always a classic! And the pops of color just makes things all the better! A few of my favorites are Merrimans, Spago, any of Bev Gannon’s restaurants, Monkeypod, Paia Fish Market (lunch spot), and of course Mamas (my favorite). Gorgeous swimsuits! I love all of bright colours & classic yet interesting cuts! You have to try the gazebo! Its up in Napili and seems weird.. I am pretty sure it is the restaurant to a little hotel up there. Go for breakfast and get the pancakes (try all the flavors and share with each other) My favorite is the white chocolate macadamia nut- you haven’t lived until you have tried one! I swear its the food we will eat in heaven! Not kidding. haha! There is also a great beach in a Napili with great rentals body surfing and snorkeling- all those little kiddos would love it! We always see turtles in February up there. There is also an awesome blowhole and “love rock” in that area that I am sure you would love! WE LOVE MAUI! Especially in February! Such cute shots – making me baby hungry! You are a hot mama, keep kicking booty! Love all the swimsuits. The black one is gorgeous! Go to Leoda’s! The mini pies are to die for! Oh, and Monkeypod in Wailea is amazing too! Love all your bathing suits! Isla looks so happy to be in the water! I am so happy you posted this! I have been LOVING everything you have put on instagram & your snaps too! You have the cutest little family! One of our favorites in Maui is Star Noodle- best asian food you will ever taste. Its a small place so definitely call ahead for reservations! Have so much fun!!! I love seeing your snaps in Hawaii. I would love to go there one day!! Love your pink bathing suit by the way. I am so in love with each swim suit you are wearing in this post! And Isla is seriously the cutest little chick! Great photos. I LOVE Maui. Try Leoda’s. They have great food all around and amazing baked goods! It’s not fancy, it but it’s oh so delicious! You have such great taste, I especially loved your classy one pieces! Love the white dress! :) Love Hawaii too! Star Noodle in Lahaina for sure, one of the best chefs in Hawaii! Mala on Front Street in Lahaina, and totally agree with everyone who says Monkeypod, although now you are on the opposite side of the island for that. The Hyatt Regency just down the beach from you has an incredible luau too. Your photos make me long for a return to Maui! The last time we were there, my husband and I were introduced to Sorrento’s On The Beach in Kihei. Amazing Mediterranean food with an appreciation of Hawaiian ingredients. The restaurant is situated steps from the sand and sunsets are unbelievable. I love all of your great outfits for hot weather!! And I love your sincerity! I like how you make your posts yours and show your gratitude. I feel like you truly enjoy what you do and don’t do it just for the money and free clothes!! (unlike Ivory Lane’s who is completely generic, vague, and never shows appreciation). Just want to comment on how amazing you look! It’s hard to believe you just had a baby! Your family is adorable and your trip looked beautiful. Isla’s little swimsuits are so cute. All of these swimsuits are adorable and your baby is too!